Crows are intelligent. 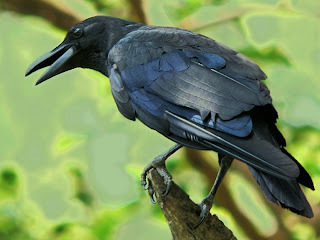 According to the Hindu Mythology, crows are a link between Heaven, Hell/Earth. They are perfect with regards to adaptability. They can even count till 7. Indeed, crows are intelligent! Crows are black, and so are cuckoos. That's the only similarity among these birds. Apart from their respective melodies, they also have a conflicting model of homes. Cuckoos never lay eggs in their own nests. Huh! They are too lazy to build nests. Lucky birds, they can afford laziness of such levels! Anyways, so they lay their eggs in crows' nests. Just like any parent, crows are so protective about their eggs that when their eggs are in the nests, they wouldn't allow another bird to even wander in the vicinity. But what happens to all the intelligence when the cuckoo lays its eggs in the crow's nest? Why can't a crow then count its eggs or notice that its own eggs, thrown by the cuckoo, are lying on the ground?? Love defies all the logics in this World! Yes, it does! Just like the crow who forgets the logic of counting or checking for its eggs due to the "love" for its "own eggs", we all see humans doing the same innumerable times. Like, logically, you should be studying for tomorrow's test, but you are either playing your favourite game, or watching your favourite actor's movie, or talking to your beloved or may be just thinking about your latest crush! Bunking classes for a date, taking a longer route after a tiring day just to spend a few extra moments with that special someone, buying their favourite-colour shirt instead of the one you've been wanting to buy since months, going to their favourite restaurant no matter how much you hate the food or ambience out there! I'm sure there are millions of such examples running in your mind too! Sitting on the first bench in the boring history class just because the guy/girl with the cutest smile in the whole second grade (or probably the whole primary school) is sitting there. Joining the arts club because the sweet-smelling girl could be there, although you might not even want to know if red looks better with green or blue! Yes, it probably starts that early!! Is it right or wrong, good or bad? How does it matter?? You can't help it, neither can I help it. Love has kept defying logic, and it will always keep doing that!!! Absolute truth! But, this ain't for jokers who have never tasted the flavor of true love. No wonder I don't see any comment here. What would you call it if you have to rename it? My answer to this would be, "Hum sab ki kahani Nidhi ki zhubani."